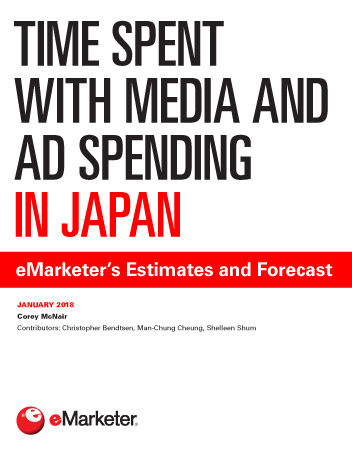 eMarketer estimates adults in Japan averaged 7 hours, 14 minutes per day with media in 2017, up 7 minutes over 2016. Rising time spent with digital media, especially mobile content, is driving overall growth in time spent. Adults in Japan spend an average of 3 hours, 3 minutes per day consuming digital media. By comparison, they spend 3 hours, 21 minutes per day with TV content, eMarketer estimates. As time with digital formats increases and that of TV stays flat, this gap will continue to close, with TV holding a slim 5-minute lead come 2019. Advertisers in Japan allocated an estimated $41.69 billion toward paid media in 2017, a 2.8% year-over-year increase. Expenditures dedicated toward digital ads will continue to rise, but low wages and slow market conditions in the country will stymie growth in total ad spending. 2017 was a milestone year for mobile in Japan. For the first time, the format accounted for more than half of digital time spent (57.2%) and ad spending (56.1%). As more adults in Japan trade in their feature phones for smartphones, growth in mobile ad spending will continue to rise throughout the forecast. Though print made up 23 minutes of daily media time, its audience—for the most part affluent and highly literate—holds value to marketers. At least one-fifth of ad spending in Japan is dedicated to newspapers and magazines. "Adults in Japan spend nearly 90% of their daily media time consuming TV or digital content, while mobile takes up nearly one-quarter (24.1%) of total media time."